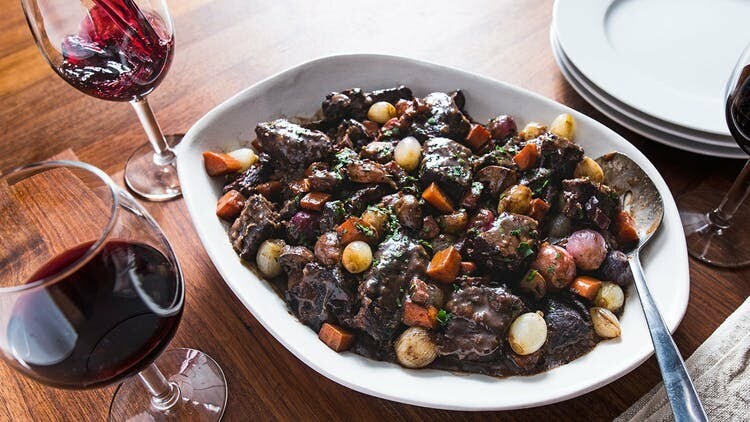 The epitome of French home cooking, boeuf bourguignon is engraved into the memories of many chefs who were raised on the dish. "I grew up in Alsace, France, and while my mother was a great cook, my father was the best at making dishes like boeuf bourguignon," Antoine Westermann, chef of Le Coq Rico in NYC and Paris, says. "One of my most vivid memories of the dish is being in my childhood kitchen with my father, and all of the chairs in the kitchen would be covered with his homemade egg noodles—which look like tagliatelle and were always served with his boeuf bourguignon—that he would hang on the back of all the kitchen chairs to dry." 1. In a large Dutch oven, heat the vegetable oil over medium-high heat. Add the bacon lardons and cook until golden brown, 7 minutes. Using a slotted spoon, transfer the bacon to a plate. Season the beef with salt and pepper, then add it to the pot. Cook, turning as needed, until golden brown, 16 to 18 minutes. Transfer the beef to the plate with the bacon. 2. Add the onions and garlic to the pot and cook until soft and caramelized, 5 minutes. Sprinkle in the flour and cook for another 2 minutes. Add the cognac and stir, scraping up any fond that has developed on the bottom of the pot. Slowly pour in the wine and the beef stock, stirring until incorporated. 3. Using butcher's twine, tie together the parsley stems, thyme, bay leaves and celery, then add the bundle to the pot, along with the reserved beef and bacon. Bring to a boil, then reduce the heat to a simmer. Cook, covered, until the beef is tender and the sauce is thickened, 2 hours. 4. Meanwhile, in a large skillet, heat the butter over medium-high heat. Add the mushrooms, onions and carrots, and cook until golden brown, 10 to 12 minutes. Stir into the braising beef for the last 30 minutes of cooking. 5. Season with salt and pepper, then divide between bowls. Garnish with parsley and serve.